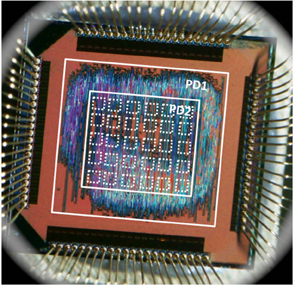 In terms of speed, energy consumption and size, inexact computer chips like this prototype, are about 15 times more efficient than today's microchips. By allowing for occasional errors, prototype “inexact” computer chips are more efficient than today’s technology, improving power and resource efficiency. The research, which earned best-paper honors at the conference, was conducted by experts from Rice University in Houston, Singapore’s Nanyang Technological University (NTU), Switzerland’s Center for Electronics and Microtechnology (CSEM) and the University of California, Berkeley. ISAID is working in partnership with CSEM to create new technology that will allow next-generation inexact microchips to use a fraction of the electricity of today’s microprocessors. This comparison shows frames produced with video-processing software on traditional processing elements (left), inexact processing hardware with a relative error of 0.54 percent (middle) and with a relative error of 7.58 percent (right). The inexact chips are smaller, faster and consume less energy. The chip that produced the frame with the most errors (right) is about 15 times more efficient in terms of speed, space and energy than the chip that produced the pristine image (left). The concept is deceptively simple: Slash power use by allowing processing components — like hardware for adding and multiplying numbers — to make a few mistakes. By cleverly managing the probability of errors and limiting which calculations produce errors, the designers have found they can simultaneously cut energy demands and dramatically boost performance. In their initial simulated tests in 2011, the researchers showed that pruning some sections of traditionally designed microchips could boost performance in three ways: The pruned chips were twice as fast, used half as much energy and were half the size. In the new study, the team delved deeper and implemented their ideas in the processing elements on a prototype silicon chip. Palem, the Ken and Audrey Kennedy Professor of Computing at Rice, who holds a joint appointment at NTU, said likely initial applications for the pruning technology will be in application-specific processors, such as special-purpose “embedded” microchips like those used in hearing aids, cameras and other electronic devices. The inexact hardware is also a key component of ISAID’s I-slate educational tablet. The low-cost I-slate is designed for Indian classrooms with no electricity and too few teachers. Officials in India’s Mahabubnagar District announced plans in March to adopt 50,000 I-slates into middle and high school classrooms over the next three years. The hardware and graphic content for the I-slate are being developed in tandem. Pruned chips are expected to cut power requirements in half and allow the I-slate to run on solar power from small panels similar to those used on handheld calculators. Palem said the first I-slates and prototype hearing aids to contain pruned chips are expected by 2013. Be the first to comment on "“Inexact” Computer Chip, 15 Times More Efficient than Today’s Technology"